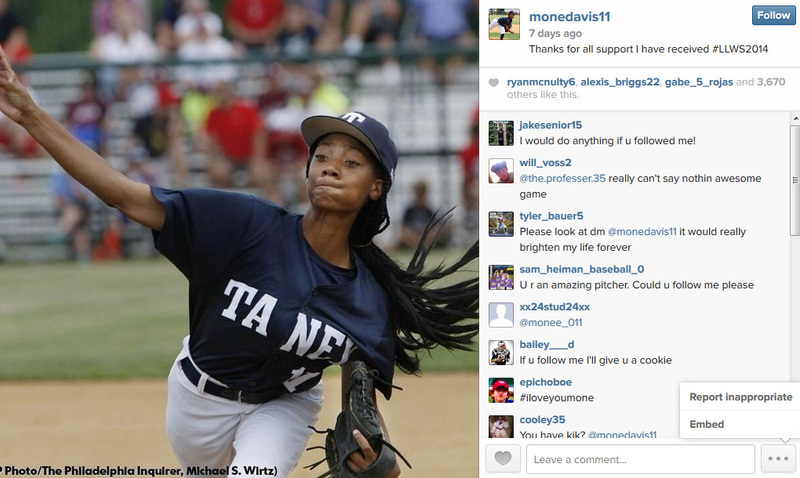 Despite only joining social media recently, Mo'Ne Davis has gained almost 70,000 followers on Instagram and Twitter. The 13-year-old Little Leaguer Mo’ne Davis not only landed the cover of Sports Illustrated this week, she’s gained a huge following on social media as well. Magic Johnson, Michelle Obama and Lil Wayne have all tweeted about her, and the young athlete herself has enjoyed very fast growth on social platforms thanks to the buzz. 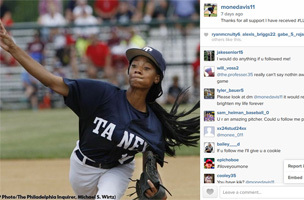 Davis sent her first (re)tweet on August 11 from @Monedavis11, and quickly racked up over 29,000 followers. She joined Instagram shortly after, posting a picture of herself on the field on August 15. Her Instagram has gained over 39,000 followers in one week.